CAMBRIDGE — As firefighters continued to battle a blaze that leapt from building to building in a densely packed neighborhood, Assistant Fire Chief Gerry Mahoney waited anxiously for the missing-person calls to start coming in. In 33 years with the department, Mahoney said, he had never seen a fire spread like Saturday’s 10-alarm blaze, which destroyed or damaged 16 buildings and incinerated a row of parked cars. Even when no calls came in, when the fire was out and the sun rose again the next morning, Mahoney braced for firefighters picking through the rubble to find bodies. But they did not find any. No one was injured, and the only reported casualty, according to the Red Cross, was a cat. Still, it left scores displaced and reduced a neighborhood of familiar New England visuals — three-deckers and two-families, vinyl siding and church spires — into a scene of char and rubble. 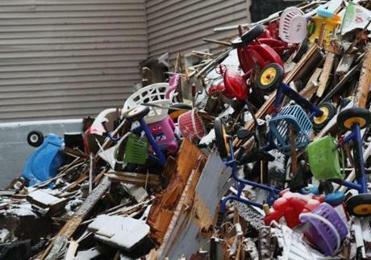 Plastic tricycles and laundry baskets, fleece blankets and old television sets poked out among splintered wood and other debris on Monday morning, as an excavator crunched through a fire-blackened building in light snow. Mahoney put the low-ball damage estimate at $10 million to $15 million. Destroyed toys. Melted sidings. Investigators are navigating piles of debris to determine the cause of a 10-alarm fire that has displaced more than 125 people. As the count of displaced people surpassed 100, officials pinpointed a three-decker at 35-37 Berkshire St. that was undergoing a complete renovation as the fire’s origin. In a joint statement, the state fire marshal’s office and city officials said there was no evidence of arson, though they continued to investigate the specific cause of the fire at the construction site. Mahoney cautioned that buildings stripped to the studs are especially flammable, and said the combination of strong winds and densely clustered wood-frame housing caused the fire to spread so quickly. Amid rumblings of complaints from neighbors, the manager of the company redeveloping the three-decker expressed sympathy for those displaced in a brief phone interview Monday. “We can just tell you that all permits were filed according to the building code, we’re fully cooperating with the fire marshal and the police, and we’re extremely upset and sorry for the homeowners that have been displaced from their residences,” said Matthew Fink, who identified himself as a representative of KHF Plymouth LLC, the owner listed on the property deed as well as on a building permit issued in October. The city issued a second permit, for sprinkler installation, in November. Registry of Deeds records show KHF purchased the 3,249-square-foot, three-unit building last summer for $1.5 million, seven times the amount it had sold for in 1995. Fink is listed as sole manager and resident agent for Stoughton-based KHF Plymouth in paperwork filed with the state last year. 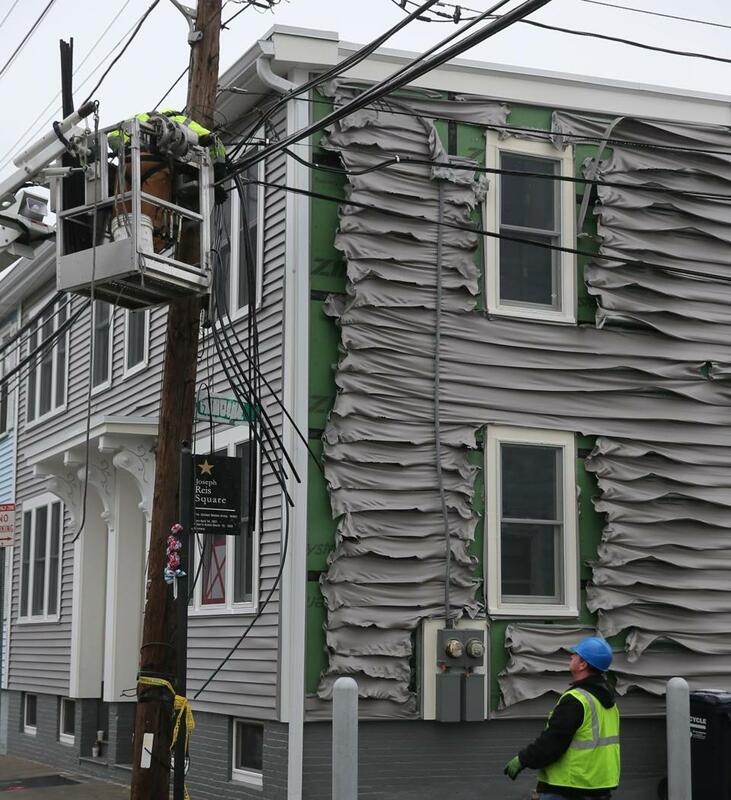 For the renovation, KHF engaged Daddy Construction LLC of Boston, which did not return a call seeking comment Monday. Ranjit Singanayagam, Cambridge’s inspectional services commissioner, said the city has no prohibition on weekend or night construction work, except on work that generates noise that would disturb neighbors. 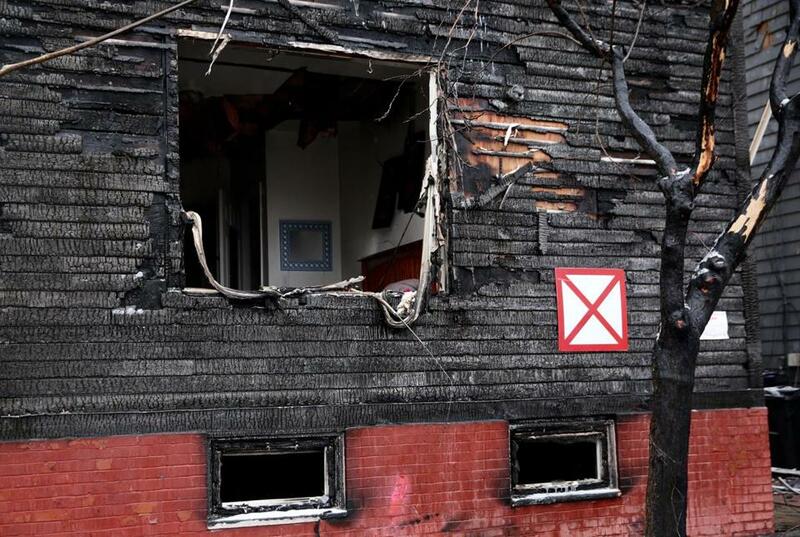 The fire left at least 19 children temporarily homeless and cut across race and class lines in an immigrant-rich neighborhood known officially as Wellington-Harrington, bordering East Cambridge. The displaced included condo owners and subsidized renters, minimum-wage workers and Kendall Square software developers, people who had moved in last month and people whose families had been in the same home since the Depression. Andrew Kelleher’s extended family has long owned two side-by-side houses at Berkshire and Plymouth streets, one a total loss, one hopefully salvageable. He said the destroyed home was a source of memories — door-frame notches measuring his mother’s height 50 years ago and his own in the 1980s — and also housed his aunt’s day-care business. Beyond the collapsed building where the fire started, two other buildings had been razed as of late Monday, with decisions pending on others, Mahoney said. The list of properties officials hope can be repaired includes St. Patrick’s Place, a 32-unit affordable housing community in a former church that sustained “major damage,” Mayor E. Denise Simmons said. Just-A-Start, the community development corporation that developed St. Patrick’s, is putting residents up for a week in hotels while that organization and other public, private, and nonprofit developers are working together to find “semi-permanent” housing for all who need it, Simmons said. Displaced families filtered in all day at City Hall, where an array of state, city, and nonprofit agencies are working this week from a “temporary resource center,” helping victims navigate issues such as insurance complexities, school continuity, and housing assistance. As well-meaning residents brought sandwich platters and bags of old clothing to City Hall, the mayor encouraged those wishing to help to donate instead to a relief fund at City Hall or through the City of Cambridge website. With few resources to sift through clothing and sort out dietary restrictions, money is more immediately useful for groceries, clothing, and holiday gifts, she said. St. Patrick’s resident Hewan Mesmer, 23, said her family does not yet know if or when they will be able to return to the apartment where her father, an immigrant from war-torn Eritrea, raised and sent three children to college as a single parent. Her younger siblings are still in school, displaced amid exams, said Mesmer, a recent graduate who works at Dana-Farber. She said she was grateful for her health, and for all that the firefighters and donors have done, but wistful about the lost photos and mementos she had imagined saving for her future children. “What am I going to show them?” she asked. Eric Moskowitz can be reached at eric.moskowitz@globe.com. Follow him on Twitter @GlobeMoskowitz. Olivia Quintana can be reached at olivia.quintana@globe.com. Follow her on Twitter @oliviasquintana.